Leaving Oswego for Phoenix brought a shift in the feel of the tour. No longer were we in large water, where the horizon is unbroken by land. Nor were we in a huge shipping channel, with freighters the size of buildings moving past us. 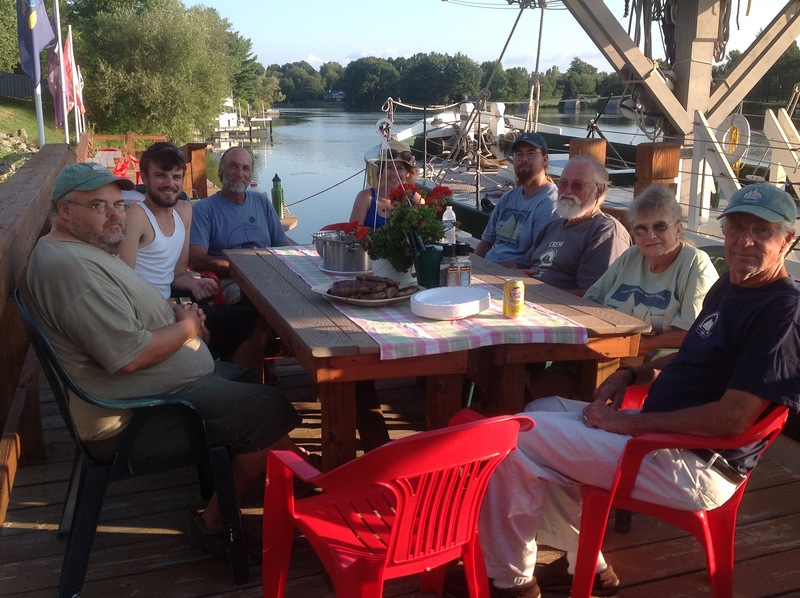 We were back in the American canals, the New York State Barge Canal system. Returning to the New York canals always feels comforting. This would be our third time through the eastern half of the canal, and we were all happy to be back in familiar territory. It doesn’t hurt that the canal in the fall is truly beautiful. During our transit from Oswego to Phoenix, as part of my constant learning experience as First Mate, I got to take the Lois into a lock for the first time. However, the lock that I drew for this learning experience decided it was going to give me a real lesson. The dam at the lock was also part of a power station, which during my approach was wide open with the station making full power. This created quite an interesting eddy right at the lock, which took me by surprise. It first sent the boat to the left, and then as I corrected for that, narrowly avoiding the concrete wall on the east side of the approach, the eddy took the boat towards the other side of the river. Despite the corrections I made, the current took the Lois and spun her upstream. In slow motion, she was pinned against the bullnose and rotated sideways in the opening of the lock. At this point, I looked to Roger for advice. His thoughts? Turn around and try again. With the Oocher pulling the bow around, the Lois spun easily away from the lock, and the Churchill powered us out of the eddy downstream. I gave myself a goodly amount of space, and lined up for a second run. Before I started, I told Roger that if there needed to be a third try, it was all his. Thankfully, with the first hand experience of how the eddy ran, I was able to just squeak the boat into the lock before getting pulled sideways again. It was a memorable first lock. When we got into Phoenix, at the end of a long day, the docks called to us. With a great boardwalk style walkway, flowers hanging along the path, and a beautiful sunset, the crew all sat next to the boat at the tables, and we had dinner ashore. It was fantastic to sit in a chair with a back, enjoy a great meal, and not have to walk more than 10 steps back to the boat. Phoenix heralded another change in the tour for us – the beginning of school programs. Summer visitation is a very different style of interpretation for the crew members. There is less structure, more free style conversation as opposed to the routine of guiding a group of students around the boat. While this can often lead to some very interesting conversations, the style of a guided program can be a welcome change. As an interpreter, there is a major sense of satisfaction brought by wrapping up a story right as the bell rings to change stations. While all the communities we stop at have connections to the waterfront, some are more easily connected to than others. Phoenix had a large wooden boat building presence, building scows and canal boats exactly where we were docked, 150 years prior. On our way up the Oswego River, the ever vigilant Art Cohn picked out the possible remnants of such a scow laying half out of the river bank. Being able to share that kind of local history with kids is one of my favorite parts about school programs.